A nice run through very remote country, fairly close to Phoenix. This run stretches for 12 miles from Kelvin, AZ on 177, to Cochran Road. This is a nice alternative to the Lower Salt and Lower Verde, close to Phoenix but sees almost no traffic. It only seems to go in the summer, when the San Carlos Reservoir is doing agricultural releases. There are a few splashy sections but no real rapids. Unlike the lower salt, there is consistent good flow all the way, with no long placid sections requiring a lot of arm power. There are some mild sweepers and strainers to dodge, and when we passed through in summer 2016 a local rancher had strung barbed wire across two sections of the river. Fortunately, the flow was slow enough approaching the fences we were able to lift them enough to duck under. Stringing barbed wire across public waterways like this is technically illegal, but I think few people pass through here. The next group who wants to do a service project should consider packing a pair of wire cutters. 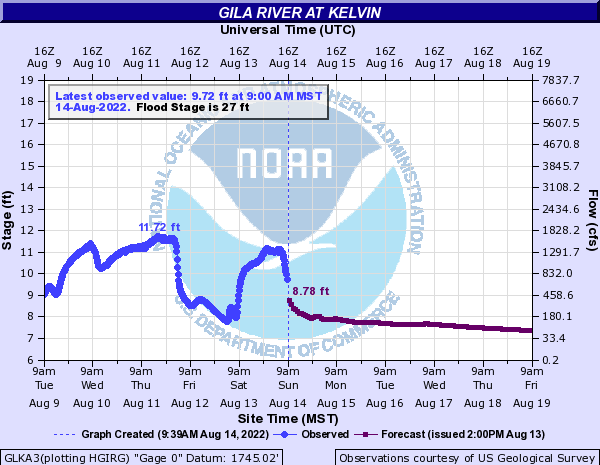 Primary Gauge GILA RIVER AT KELVIN, AZ. Take the Kelvin-Florence Highway to Kelvin, AZ. Turn east on Riverside Road and drive about a quarter-mile upstream to a small pullout on the north side of the road. Take the Florence-Kelvin Highway (well-graded dirt) to Kelvin. Turn east on Riverside Road and drive upstream about a quarter-mile to a pullout on the north side of the road. Take the Florence-Kelvin Highway (well-graded dirt) out of Florence. After 15.8 miles, take the marked turn north onto Cochran Road. Drive 13 miles on Cochran Road to the river. It is rocky, but I made it to the river in a Ford Focus. A High-Clearance Vehicle would have no problem with the road. There's camping at the river, but its going to be baking hot any time the river is running.